Looking for something new to do on your lunch break? A place to hang out while taking in the sights and sounds of downtown? Come down to McGraw and Westlake squares! 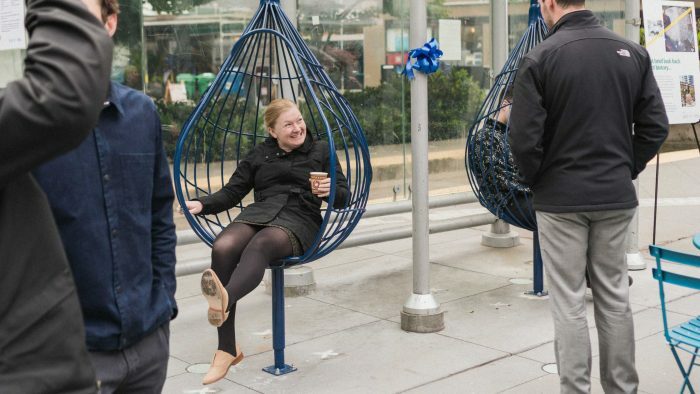 In spring of 2018, DSA, in partnership with the Seattle Department of Transportation, and design firms DCI and Framework, brought a number of enhancements to these centrally located public spaces. Inspired by our legendary weather, we installed unique raindrop-styled seating, along with wave benches and rain gardens. We’ve brought in food trucks during lunch, and games, including foosball and chess. The spaces are staffed daily by DSA’s friendly and knowledgeable ambassadors. These beautification efforts follow the installation of ground lighting, tables, greenery and flowers by SDOT. It all adds up to refreshed and inviting spaces in the heart of downtown. Next time you’re looking for a respite in the middle of the city, stop by McGraw and Westlake squares.